Provided it’s run from within a GNOME session, it takes care of changing and restoring the desktop background and taking the required screenshots. If you know how to do the same in other environments, I’m all ears. Though, even better than all of this would be a low level approach that gets the code responsible to draw all the stuff seen on top of the background to do so for various resolutions and to save that in image files right away. The following walk-through will explain the idea behind and the use of the 4 command line tools from the Backtestground collection. An image that may contain panels, docks, icons and windows, all on a transparent background in place of a wallpaper, is what I call a background context. These can be used to layer them on top of wallpapers, to evaluate wallpapers in another context than your current environment. Create the setup you want regarding what is and isn’t visible on the screen. Change the background to white. On Ubuntu/GNOME, you can just right-click any empty dektop space and choose Change Desktop Background. Doing so on another workspace allows you to keep the Appearance Preferences window open while maintaining the desired setup on the initial workspace. Take a screenshot, name it on_white.png. For this guide, lets say you save it in bg_test in your home directory. Change the background to black, make another screenshot, call it on_black.png. Edit both screenshots to remove differences such as the mouse pointer (remove it entirely or make sure it’s in the same position) and the time of day (copy that part of the panel from one image to the other). The result will be called context.png. But what if you need to combine the context with wallpapers in other resolutions? and use the arrow keys to move through the images. Have a wallpaper and need it in other resolutions, scaled and cropped to the varying aspect ratios? Results will be saved in a new directory background_resolutions. This way you can simulate the outcome of the Style: Zoom setting in Appearance Preferences, Background tab on systems running at one of the resolutions (though the interpolation and thus the image quality might be different). Results will be saved in a new directory background_resolutions_under_context_resolutions. to-common-resolutions and context-to-common-resolutions use the same configuration file: ~/.config/backtestground_resolutions (or ~/.backtestground_resolutions, if there’s no .config directory. Executing one of them will create the file if necessary, filled with a list of the 14 default resolutions. Resolutions are specified in width, height order. Formatting doesn’t matter and all text will be ignored. There are even man pages now, created from docbook xml sources! and themes other than the one you are currently using. 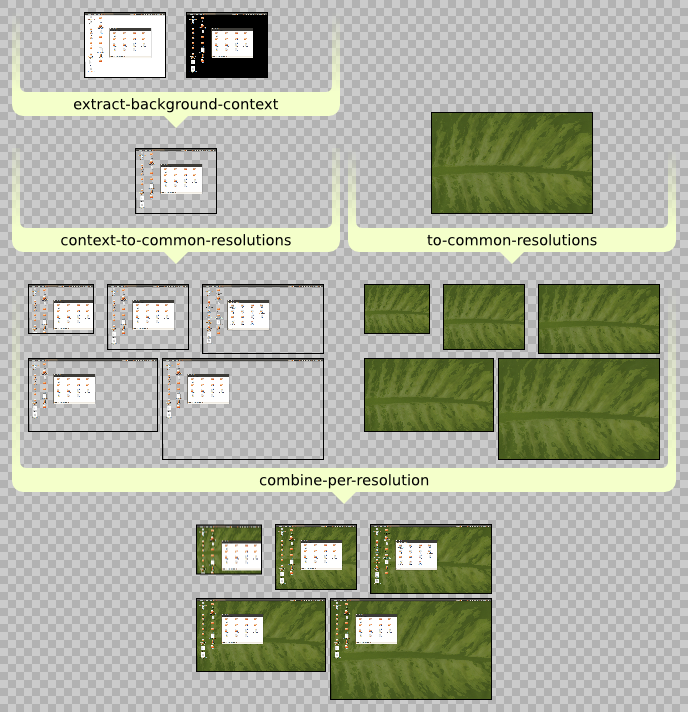 Expects an image as input and crops/resizes it to several common screen resolutions. The resolutions are now specified in a configuration file. Expects an image with transparent background, that may contain panels, icons and windows (like extract-background-context produces) and crop/resizes it to several common screen resolutions, while doing something hopefully sensible with the content. These are not included in the package, as it’s not possible to install files to the user’s Templates folder that way. The setup script in the tarball does install them, if there is a Templates folder. Both have a 2560 x 1600 pixel canvas to use the largest commonly offered resolution, currently. Passepartout layers allow to see how things will look when this space is cropped to conform to other common aspect ratios. This simulates the effect the Style: Zoom setting in Appearance Preferences: Background will have: the image is scaled up or down such that it fills the screen without distorting it. If the aspect ratio of the image is wider than that of the screen, it will be scaled to the same height and the areas on the side will be cropped. If the aspect ratio of the image is taller than that of the screen, it will be scaled to the same width and the areas on top and bottom will be cropped. For Ubuntu and Gnome users: Putting them into your Templates folder makes them available in Nautilus or on the desktop by right-click, Create Document. The Inkscape SVG file supports batch export to 14 screen resolutions. This will create 14 files with names like size_1024x0768.png in the same folder as the opened file. The size_ part is an easy target for a search-and-replace on the SVG file, if you want a specific prefix or target path. You might want to remove the rectangles in the targets layer matching unwanted resolutions. Repeatedly Alt-clicking allows to cycle through stacked objects in Inkscape (your window manager might be configured to intercept Alt-clicks, though). For this cycle, we discussed that the Ubuntu Artwork Team should do more for the community. The misconception that the team has anything to do with Ubuntu-the-product’s visual design and default theme has to die. I lean towards the same for the hope this could change. The Ubuntu flavours Edubuntu and Xubuntu need wallpapers for the upcoming 11.04 release. Members of the Artwork Team talked with representatives of the projects to develop specifications for wallpapers. Art and design are about communication. A distribution not only can say something with the default wallpaper, it will say something. It’s better to take control of it, otherwise it will look like a lack of care and understanding. That’s why the specifications are about a desired message. Focusing on trying match the user’s tastes is unlikely to work out. Especially if you don’t have a well defined audience. Attempts to please everyone easily end up with something that just barely manages to step on no one’s feet. Many users like to change the wallpaper just to make the desktop their own. So the default wallpaper may as well be about the identity of the project, as it surely won’t be about the identity or taste of a particular user. Everyone is welcome to contribute. Any technique and medium goes, as long as you end up with a wallpaper of the right size. Feel free to build on the work of others and to collaborate, as this is not a contest. Spread the word, if you support this effort. Backtestground is a project collecting a few tools to aid in designing wallpapers. bgce command-line tool (Python script). Put it in /usr/local/bin and make sure permissions allow execution. It creates a PNG image with transparent desktop. This is useful for evaluating wallpapers that should go well with panels and themes other than the one you are currently using. bgce on_white.png on_shadow.png will create a context.png in the working directory. bgce on_white.png on_shadow.png -o custom will create custom.png (given that custom is not a directory). What still needs to be solved: creating such context images for several resolutions without lots of manual work. Maybe some kind of slicing script, taking several separate images and/or some coordinates as input. sizes command-line tool (Python script). Put it in /usr/local/bin and make sure permissions allow execution. Expects an image as input and crops/resizes it to 14 screen resolutions (except the one the image conforms to, if any). sizes input.png creates 13 or 14 files with names like 1024x0768.png. sizes input.png -o some-existing-dir will create the files in some-existing-dir. Currently you have to edit the definition of resolutions in line 50, if you want fewer or different resolutions. /usr/local/lib/python2.6/dist-packages/. No issue if I just don’t use entry_points. I managed to build a deb after wading trough horrifying amounts of documentation, but I did not manage to build a source deb that I can upload to my PPA. The process fails silently, Launchpad doesn’t tell me what’s wrong. Known issue, filed a support request. The template files should end up in the users’s Templates folder. Doable with setup.py, even if discouraged. Not possible from a package. I realise huge amounts of thought and hard work went into all the infrastructure and documentation, so I don’t want to complain too much. But this is why I simply link to a few files that can be used as they are, actually, for now.